To edit song lyrics, go into “Edit” mode with the “Pencil” button at the right of the window or use the Ctrl+E keyboard shortcut. Enter the song verses one below the other. Standard features of common word processors are available. When a verse is too long to fit on a single slide, split it in half by skipping a line. To specify whether this is a verse or a chorus, type V1, V2, V3 for a verse, or C, or C1, for a chorus. To insert a non-breaking space, press Ctrl+Shift+Space (Windows standard shortcut). A non-breaking space is represented by a red highlighted “_”. A non-breaking space requires VideoPsalm to keep the words on the same line to prevent sentences being cut at the wrong place. The type of a song verse is only indicative. Especially, no particular style is used to display any such song verse type. Modifications are immediately reflected in the slide panel (at the top right) unless the shield is active . You can also import your existing songs (OpenSong) via the import wizard. Adds a new song to the focused songbook. Deletes the selected item, either the selected song or the selected songbook. In the latter case, the songbook is removed from the list. In reality, VideoPsalm does not delete the songbook file, but renames its file extension into .json.ignore. If necessary, this enables you to recover the deleted songbook by setting its extension back to .json. Sorts the selected songbooks by alphabetical title order. Sorts the selected songbook by song number. Swaps the chord entering method between natural display and the ChordPro format. Simply type-in chords, for example C, and VideoPsalm will insert the brackets [C] automatically . Note that Videopsalm is compatible with the ChordPro notation : You can paste lyrics in the ChordPro format to and from the VideoPsalm editor. 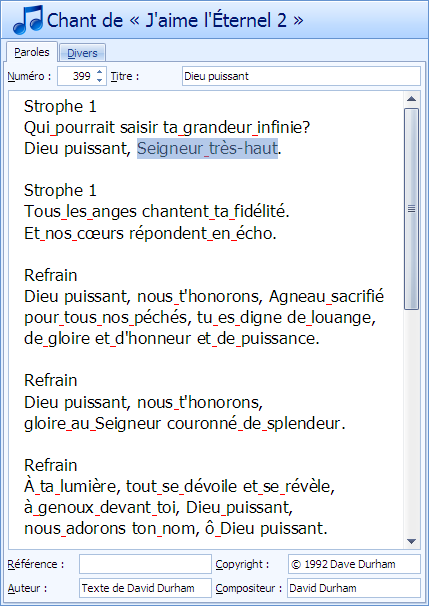 Site offering many song arrangements in ChordPro format (songs in French). To save your changes to songs or Bibles, click the “Save” button located in the “Edit” toolbar.